The team of 4th Year students Niamh Delaney and Grainne Kirby with Faculty advisor Dr William Lee were adjudged Meritorious Winners. Only 2% of all entrants were ranked higher than them. Left to right Grainne Kirby, Dr William Lee and Niamh Delaney. Lawrence Crowley Board Room, UCD Michael Smurfit Business School. FMC2 This colloquium was ran jointly by the Financial Mathematics and Computation research cluster and the Mathematics Applications Consortium for Science and Industry. Centre for Financial Markets Seminar, Michael Moore (QUB), Order Flow and the Monetary Model of Exchange Rates. The second Women in Mathematics Day, Ireland took place in UL on the 18th April. The day included keynote talks from Sandra Collins (SFI), Aisling McCluskey (NUIG) and Francesca Shearer (QUB); a diverse selection of contributed talks; and a lively panel discussion in the afternoon. Feedback from the day was very positive - please keep an eye on www.macsi.ul.ie/wimdi for details of next year's event. Panel discussion, from left to right: Dr. Aisling McCluskey (NUIG), Dr. Sandra Collins (SFI), Dr. Francesca Shearer (QUB) and Dr. Anne Brosnan (National Co-ordinator Project Maths). 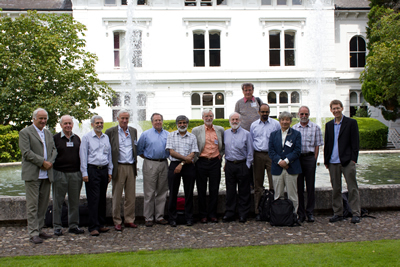 MACSI hosted the 2011 Mathematical Modelling Summer School from 20th - 24th June. 50 second level students, ranging from 16–18 years of age from around Ireland took part in the residential Summer School. Students engaged in a number of activities during the week including a ‘mathematics in the real world’ one-day workshop where they had the opportunity to apply the mathematics they know to problems they are familiar with in everyday life. The first Student Mathematical Modelling Workshop was held by MACSI on the 23rd - 24th June. The workshop provided participants with hands-on experience in the mathematical modelling of real-world problems. It also acted as introduction to study groups with industry. 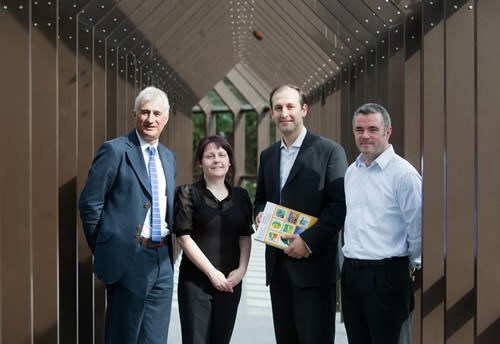 From left to right: Prof Brian Fitzgerald, Vice-President Research (UL), Dr Martina O'Sullivan, Project Facilitator MACSI, Dr. Thibaut Lery, European Science Foundation and Dr. Rory Jordan, Science Foundation Ireland. The conference had as guest of honour Jim Murray, Professor Emeritus of the Universities of Washington and Oxford. Invited talks were given by a range of distinguished speakers, and surveyed a number of different subjects within the life sciences.Contributed presentations were in the form of posters. Invited speakers at the Mathematical Frontiers in the Life Sciences. 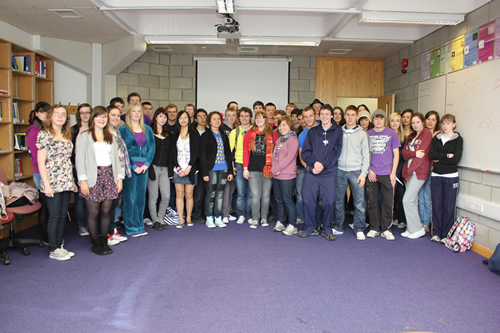 The University of Limerick hosted the Irish Mathematical Society September Meeting 2011 on August 29th and 30th this year. Details are available at http://www.maths.ul.ie?IMS_UL_2011/ The meeting was held a week early this year to avoid a clash with a conference at QUB.